Blog #7: What are Containers? Containers are a method of operating system virtualization that allow you to run an application and its dependencies in resource-isolated processes. Containers allow you to easily package an application’s code, configurations, and dependencies into easy to use building blocks that deliver environmental consistency, operational efficiency, developer productivity, and version control. Containers can help ensure that applications deploy quickly, reliably, and consistently regardless of deployment environment. Containers also give you more granular control over resources giving your infrastructure improved efficiency. Running containers in the AWS Cloud allows you to build robust, scalable applications and services by leveraging the benefits of the AWS Cloud such as elasticity, availability, security, and economies of scale. You also pay for only as much resources as you use. Containers enable portability and help reduce the organizational and technical frictions of moving an application through the development, testing, and production lifecycle. Containers encapsulate all the necessary application files and software dependencies and serve as a building block that can be deployed on any compute resource regardless of software, operating system, or hardware configurations (e.g., you can run the same container on your Ubuntu laptop and on your Red Hat Enterprise Linux production servers). Whatever you package as a container locally will deploy and run the same way whether in testing or production. This is beneficial for you and your organization because you can deploy an application reliably and consistently regardless of environment. This helps you avoid manually configuring each server and allows you to release new features faster. 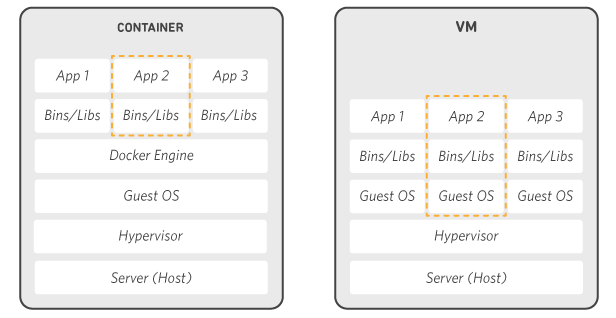 Containers can help you get more from your computing resources by allowing to you easily run multiple applications on the same instance. With containers, you can specify the exact amount of memory, disk space, and CPU to be used by a container on an instance. Containers have fast boot times because each container is only a process on the operating system running an application and its dependencies. This reduced footprint enables you to quickly create and terminate applications or tasks encapsulated in a container allowing you to rapidly scale applications up and down. You can use blue-green deployment patterns to rollout new application versions (e.g., using Amazon Elastic Container Service) because the entire application and all its dependencies are contained in an image. Containers also provide process isolation, which allows you to put each application and its dependencies into a separate container and run them on the same instance. There are no shared dependencies or incompatibilities because each container is isolated from the other (e.g., you can run two containers that use different library versions on the same Amazon EC2 instance). You can also create container images that serve as the base for other images. Operations teams can create a base image composed of the operating system, configurations, and the various utilities they want. Development teams can then build their application on top of the base image. This allows you to avoid the complexities of server configuration. Containers increase developer productivity by removing cross-service dependencies and conflicts. Each application component can be broken into different containers running a different microservice. Containers are isolated from one another, so you don’t have to worry about libraries or dependencies being in sync for each service. Developers can independently upgrade each service because there are no library conflicts. Containers allow you to track versions of your application code and their dependencies. Docker container images have a manifest file (Dockerfile) that allows you to easily maintain and track versions of a container, inspect differences between versions, and roll-back to previous versions.